The DUKW® (later pronounced "duck") was a six-wheel-drive amphibious truck that was designed by General Motors Corporation during World War II for transporting goods and troops over land and water and for use approaching and crossing beaches in amphibious attacks. The D indicates a vehicle designed in 1942, the U meant "utility (amphibious)", the K indicated all-wheel drive and the W indicated two powered rear axles. Our Captain Explorer DUKW® is a Vietnam War version will bring you on a land adventure before splashing down in the waters of Marina Bay. A Great Experience when you charter the boats for group excursions. Land: Start off with a city exploration - a drive around the city landmarks like Esplanade, Padang, Supreme Court, City Hall and War Memorial. Sea: Splash down the water for a different experience! Photo shots of Merlion - our Singapore icon! A promise of fun and excitement that you should never miss! 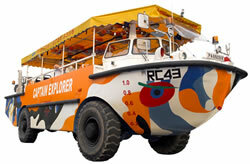 The only Captain Explorer DUKW (pronounced Duck) trail that splashes down from Marina Bay!